The one bread I have become rather partial to in the last few years is Cinnamon Raisin Bread. The thing, however, that I do not like about the store bought brands is that they are invariably made with white flour and other ingredients that one cannot get one's tongue around!! 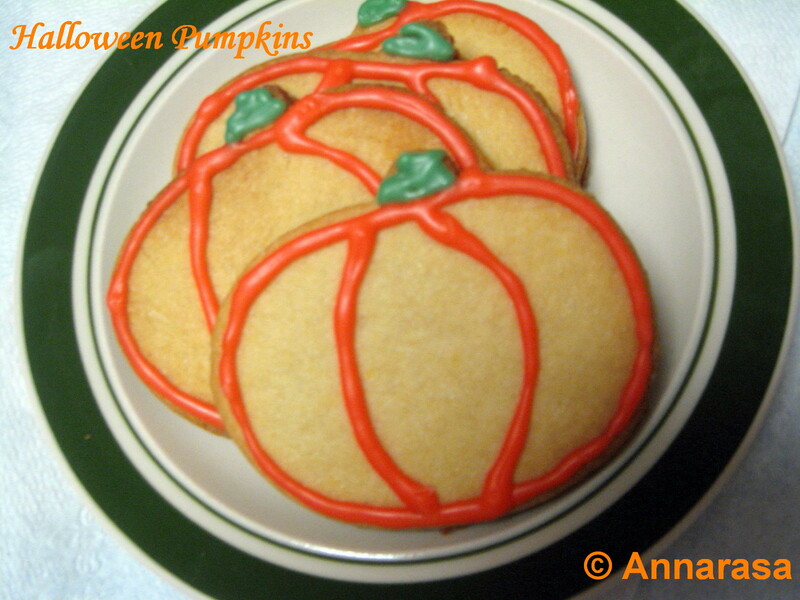 If you eat pumpkin, you will love this recipe!! On the other hand, I am tempted to say if you always ignored the this humble vegetable, this recipe may win your taste buds and possibly your heart. The spiciness of the curry paste and the sweetness of the pumpkin give this dish a delicious flavour. You can make this with any kind of pumpkin, but I like to prepare it with a combination of the acorn squash and butternut squash. The combination of these two different types of pumpkin helps balance the flavours in this dish beautifully. The vegetarian sausage recipe is superb - loved this challenge. Will pen in details of my alterations as time permits:) Thanks Jenn and Jill for this wonderful Daring Cooks Challenge. Post Script: Jenn and Jill have challenged The Daring Cooks to learn to perfect the technique of poaching an egg. They chose Eggs Benedict recipe from Alton Brown, Oeufs en Meurette from Cooking with Wine by Anne Willan, and Homemade Sundried Tomato & Pine Nut Seitan Sausages (poached) courtesy of Trudy of Veggie num num. 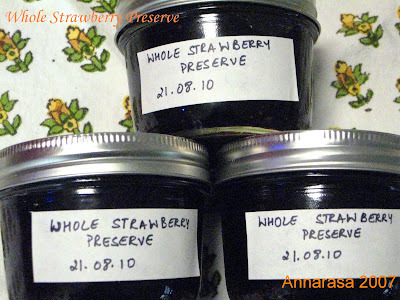 All content, text and photographs in this blog, unless otherwise noted, are Copyright of © Annarasa 2007 - 2011. All Rights Reserved. Kindly do not reproduce without permission. I just crave the taste of garden fresh vegetables in the winter. Though we are under 9 inches of snow here and it is bitterly cold here, we are lucky to get crisp and juicy salad vegetables in our favourite stores. 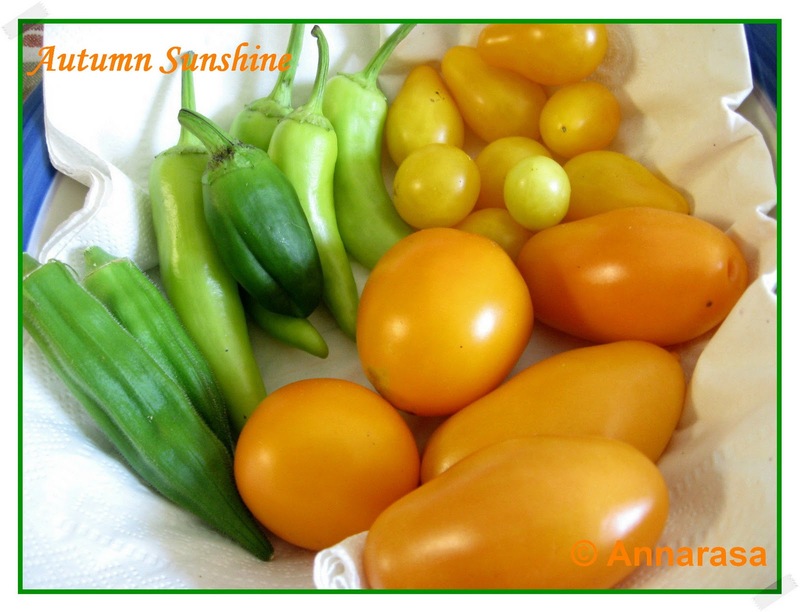 Last week, I bought sweet bell peppers: red, yellow, and orange, crunchy cucumbers, and some beautiful tomatoes for a salad. This is a salad I love - it has a light home made dressing that I make with yogurt and lots of nuts and seeds to add to the crunch!! Tofu is one of my favourite foods. I use it in a variety of ways including to make Indian style vegetables and curries. Last night I paired it with one of my favourite vegetables - methi or Fenugreek. Fresh methi leaves are not very easily available to me so I tend to get the fresh frozen variety or the dry ones. 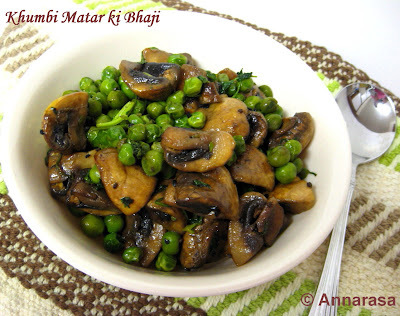 For making methi vegetable, the fresh frozen variety is best. I always have a box of mushrooms in the refrigerator. They perk up stir-fries, pasta sauces, bakes, soups, grilled toasts, and salads!! Interestingly, mushrooms do well with Indian dishes as well - they can and do take on the flavour of Indian spices and herbs beautifully. As always a winner from the Daring Bakers. I tweaked the recipe for the crust quite a bit to avoid eggs!! 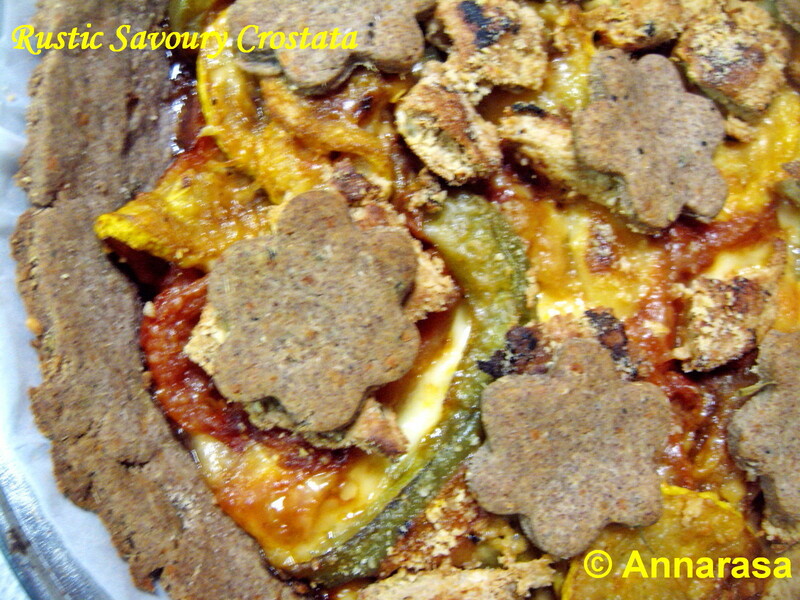 As for the filling - well it just had to be savoury:) This Crostata came out lip-smacking yummy!! The use of multiple flours in the crust gave a really nutty flavour and the filling was delicious. Don't be scared off by the darker crust - the colour comes from the Ragi or Finger Millet flour!! All I can say is that this recipe is a keeper and I am delighted that I decided to fiddle with it to suit our tastes!! This is one of my favourite soups. 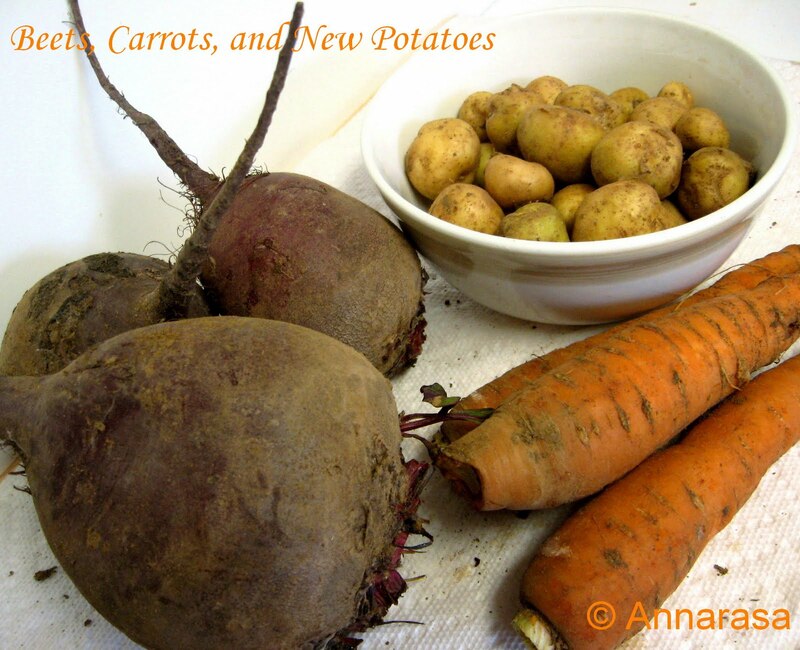 I make some variation of it every winter when root vegetables are abundant and easily available!! 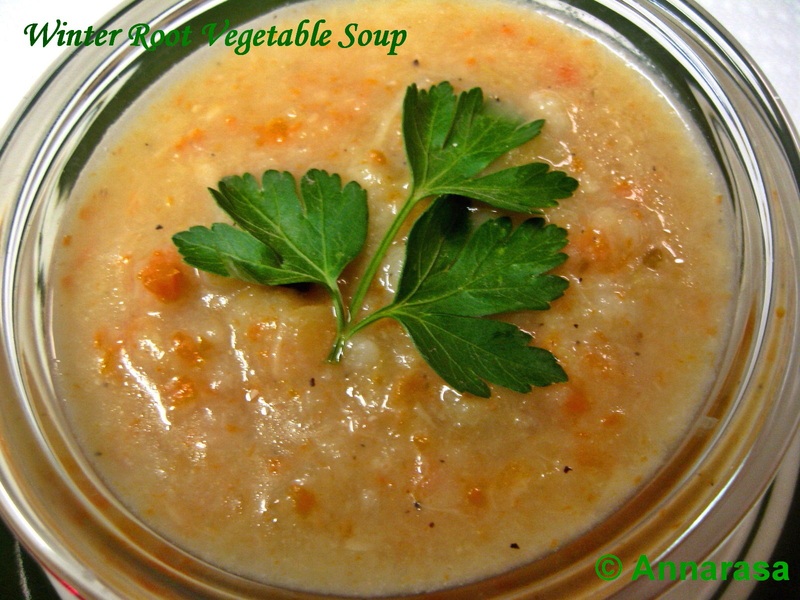 The combination of parsnips, carrots, and turnips with celery turn out an astonishingly hearty and tasty soup. If you have home made vegetable stock, use that. If not, try an organic, low/no sodium variety for the most natural taste!! Dals or lentils are a staple of the Indian Kitchen. They are prepared in a variety of ways that can often be identified as regional. Dals from the Punjab are often hearty and made with a combination of big flavours!! Chana Dal Sookhi is a fragrant combination of lentils, spices, fenugreek leaves, onions, and garlic. Salad is not the first thing that springs to mind come Autumn. However, the harvest bounty at this time of the year can and does yield some excellent vegetables, beans, and fruits for seasonal salads!! I love to serve this salad with warm Crostini slices drizzled with olive oil. 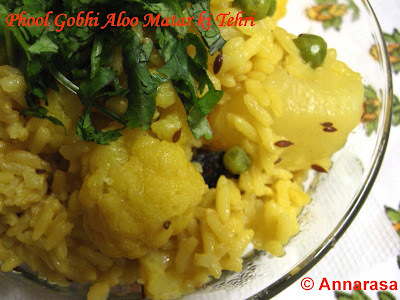 Tehri is a classic rice dish that comes from Uttar Pradesh. It is usually vegetarian and prepared with rice and some vegetables. These typically include some combination of potatoes, cauliflower, peas, carrots, capsicum, and French/ Green Beans. It is cooked with Khara Masala or Whole Spices including Kali Elaichi (Black Cardamom), Sabut Kali Mirch (Whole Black Peppercorns), Lavang (Cloves), Dal Chini (Cinnamon), and Zeera (Cumin). Its been grey, cold, and rainy here over the weekend. Some snow flurries would have been welcome and pretty, but somehow they never really made it and all we got was a chilly drizzle all day for two days! !Sunday turned out to be long and exhausting and by evening, I could not wait to dig into some comfort food, stick my achy feet up on the couch and relax!! Paneer or Indian Style Cottage Cheese is a real favourite of mine. When I first moved to this city, there was only one Indian store and I never quite trusted the fresh/frozen paneer there. I took to making paneer at home and have stuck to it ever since. Last evening I was craving just some of these creamy home made cheese curds, and I made a quick batch. 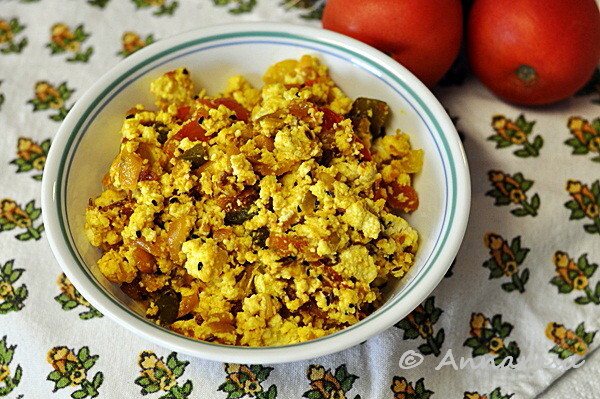 I let them stay a little soft as I wanted to make this delicious creamy Paneer Bhurji - scrambled with vegetables and spices. Sweet Green Bell Peppers are commonly referred to as Capsicum in India. In the Northern part of the country, they are also called Shimla Mirch. It usually comes into the market in the winters, and has an incredibly distinct crunchiness and sweet taste! Paired with potatoes, it makes for a wonderful stir-fry. Fresh plain yogurt is an integral part of everyday Indian meals. In fact, it is prepared and set at home every morning so that it is ready for the meals of the day! 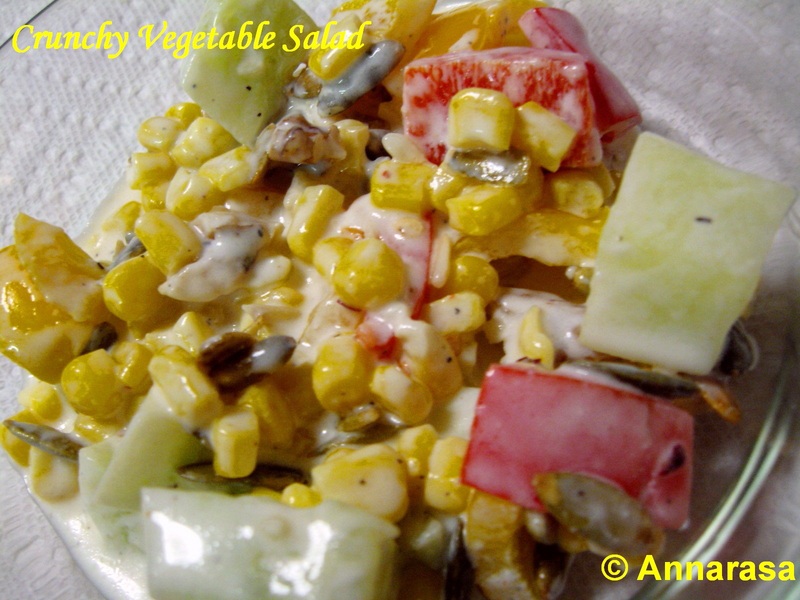 Sometimes fresh yogurt is combined with multiple ingredients and spices to make a delicious tasting salad. Boondi ka Raita is one such yummy addition to any meal. It tastes super with any paratha (Stuffed Indian Flatbread), can be the star of a meal on a festive occasion, and is probably the quickest dish you can rustle up in event of unexpected guests for dinner. I like home made boondi ( mini chickpea flour dumplings), and always make a batch whenever I get deep frying. But as I fear running out, I also like to keep a stash of good quality store bought boondi in my pantry. You can find it quite easily any Indian grocery - in fact now pre-spiced versions are also available. The key thing to to remember when buying boondi is that the packet in which they are sold must not be lined with grease. 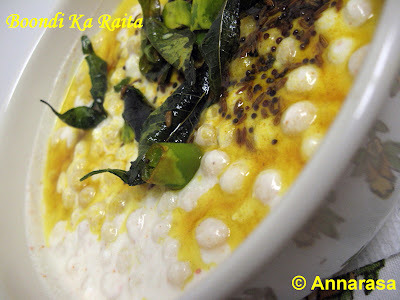 I like to make Boondi ka Raita in multiple ways! Though the basic principle of making the Raita always remains the same, I do like to spice it differently every time. 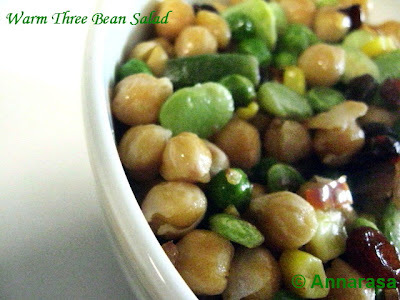 This recipe is made with a Tarka or an oil seasoning that adds a delicious kick to this very simple salad! Beat the yogurt until smooth. Blend in salt to taste. Beat in the red chili powder. Prepare the tarka by heating the oil in a small pan. Add the mustard seeds. When they begin to pop, add the cumin, curry leaves, and green chilies. Fry for a minute or until the curry leaves become crisp. Add the turmeric, turn off the heat. Season with the tarka just before serving. You can reduce the oil content in the boondi by soaking it in warm water for two minutes. Squeeze the water out of the boondi before adding it to the yogurt. Place prepared Raita in the refrigerator for at least a couple of hours before serving. This allows the boondi to soak in the yogurt and spices adding tot he flavour of this dish. Nimki is a popular savoury treat make during Diwali in North India. Deep-fried and crunchy, they are simply delicious. Though I am not very fond of deep frying, I do get down to serious some serious frying once a year, usually during the festive season. And I always try to make at least on batch of Nimki for us to munch on over the month!! 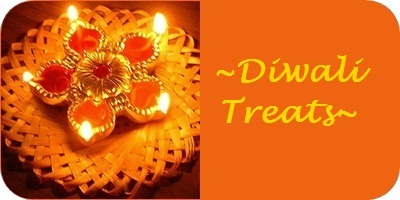 Diwali or the Festival of Lights is celebrated every winter across the Indian Subcontinent. Endless varieties of sweets and special savoury foods are prepared in homes, offered as Prasad or Neivedyam in prayers and then shared with family, friends, and neighbours!! One such sweet is Kheer or Payasam. Doughnuts!! That's what the Daring Baker's were challenged to create this October!! Whenever I think doughnuts, I am reminded of the the automated doughnut machine at a certain doughnut chain!! Every stage of making a doughnut is visible to the customer and by the time you reach the end of the line, someone hands you a hot fresh doughnut that just melts in the mouth. Luckily we live in a city where doughnut chains don't exist. Fewer the temptations the better!! After making some delicious sugar cookies for Daring Bakers September 2010, I was inspired to make a whole new batch for Halloween. I made some decorated pumpkins and ghouls. They are headed to a Halloween Party at work tomorrow!! This time I followed the DB recipe, using egg in the cookies. But I stuck to the eggless icing. Both worked well and I got some nice colourful and crunchy iced sugar cookies!! These lovely cookies go out to Akhila @ Learning To Cook for her ongoing event Dish Name Starts With: C.
Paneer or Indian style cottage cheese is both a delicious and low fat food. Its light and fluffy yet creamy texture combines well with potatoes, green chilies, and cilantro to make a lip-smacking filling for parathas. While I love parathas made with just paneer, blending it with potatoes and spices adds a whole new taste to the filling. I usually make these when we are travelling - they are so flavourful and healthy, and they make a wonderfully tasty replacement for sandwiches. Bhuni hui Arbi is a particular treat if you are fasting during the festival period! Crunchy, spicy, and a delight to bite into, I like to make this vegetable whenever I find it in the local market. If you are fasting this Navratri, serve this dish piping hot, with a bowl of chilled yogurt seasoned with rock salt and roasted cumin powder. Just about three years ago, when I began this blog, one of my posts was about Sabudana Khichiri. Extremely popular during fasts, this savoury made with sago pearls is as delicious as it is addictive. Sago is also used to make other delicious savouries during fasts including thalipeeth (pancakes) and vadas (fritters). Sweet kheer (milk based pudding) prepared with sugar or gur (jaggery) is often prepared as a Prasad (offering to the Gods). 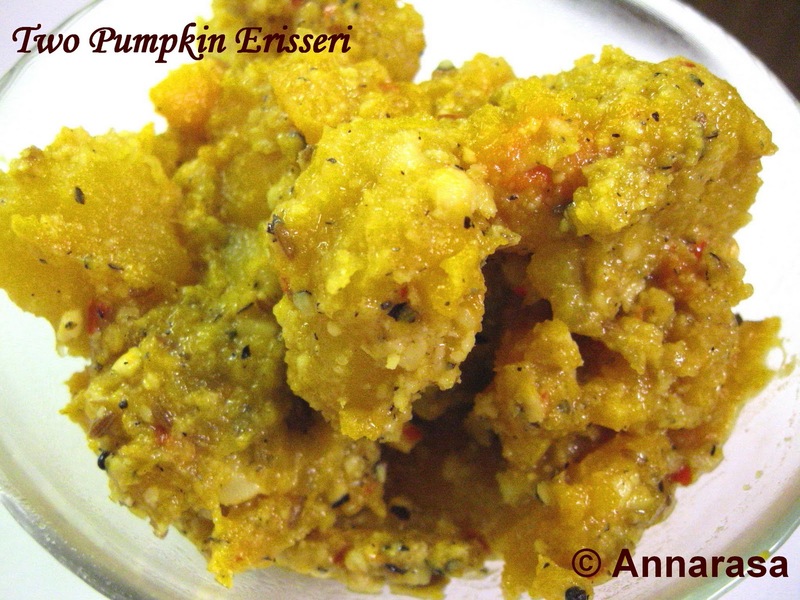 This recipe is another favourite of festival times, especially in the Northern parts of India. Its very simple to put together and guaranteed to please. If you are the kind of person who enjoys a sweet-spicy-tang, this Aloo aur Sakarkandi Chaat is for you! Aam ki Lassi is the most refreshing drink. Fresh sweet mangoes are blended with plain yogurt to get a supremely sweet and tangy drink. Mango Lassi not only quenches your thirst, its a nutrition powerhouse and will give you tonnes of energy, especially if you are fasting. 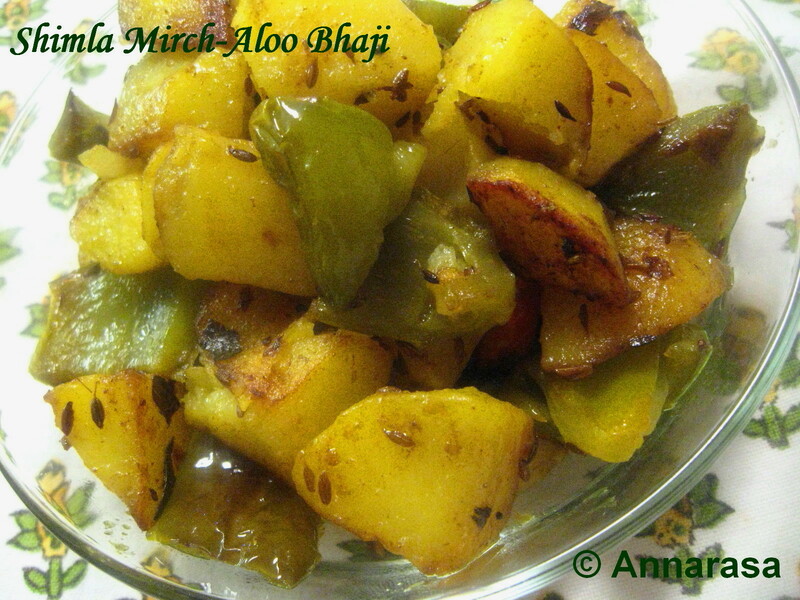 Aloo Raita is a favourite in North India. It is typically made in the winter and I always associate it weekend lunches in the warm Delhi winter sun!! 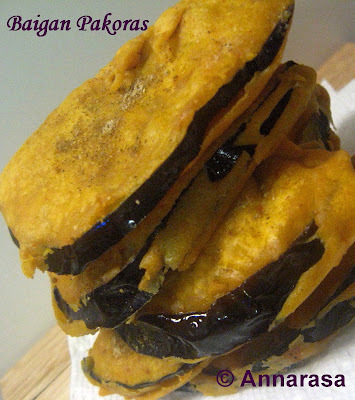 It is also one of those foods that are made during festivals, especially Sharad Navratri. This year Sahrad Navratri falls between October 8 and October 17. During these nine nights and ten days, Hindus worship the nine forms of Goddess/Mother - Devi/Shakti. On the tenth day, Vijaya Dashmi or Dusshera is observed. Making and decorating Sugar Cookies was a great challenge. The cookies turned out delicious. I made an eggless version of them! And the icing was eggless too. 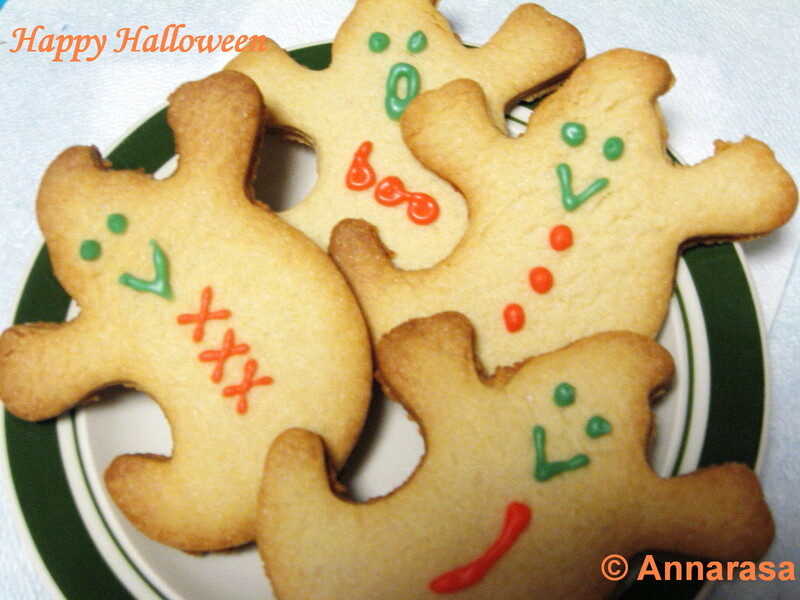 Used my new cookie cutter set to do Halloween shapes and some stars and butterflies. My plants have been doing well all summer. And now as autumn has traipsed in, I am still getting a small bounty of vegetables!! Here is some produce from my Patio Garden: juicy pear tomatoes, yellow tomatoes, some okra, and chilies!! I picked up a wonderful stash of vine ripened tomatoes from my latest run to our local 'Pick-Ur-Own' at canning prices. 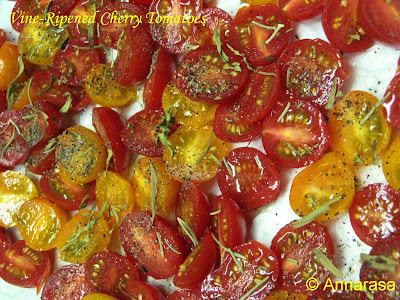 There were red tomatoes, Roma, cherry tomatoes, and my favourite the pick tomatoes with their flavoursome tanginess. Leaving the cherry and pick tomatoes aside, I pickled all the red and Roma tomatoes using two of my well-tested recipes. Whenever I think porridge, I remember the milk and honey soaked dalia (broken wheat) of my school days. 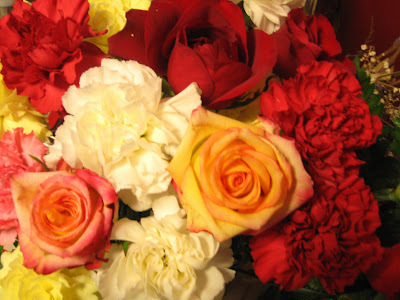 Now a days, I like my dalia salty, and yes you guessed it, spicy!! Here is a recipe that is both quick and easy. I like to make this for weekend breakfast, as it is both nutritious and filling and perfect for a good start to the day!! Ah! 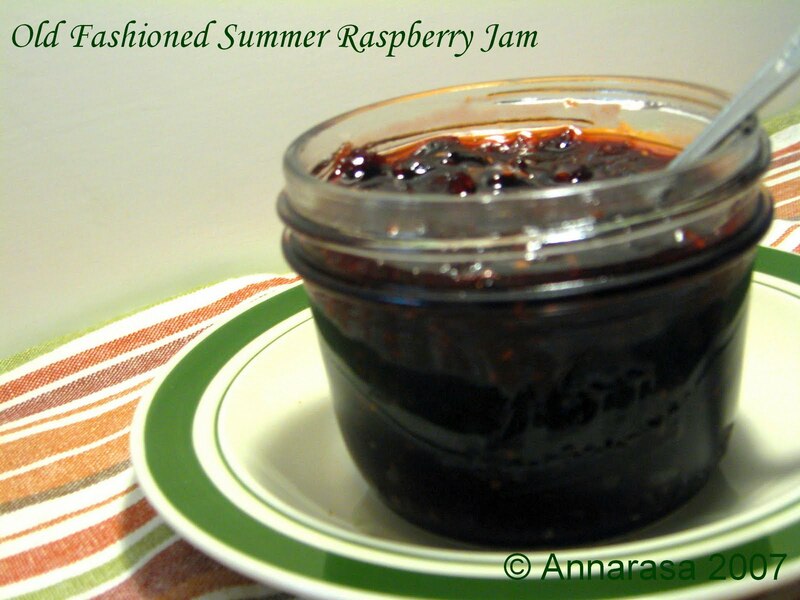 Food Preservation, what a perfect theme for late summer! Living in the northern hemisphere, there is the urge to squirrel away the bright flavours of summer for the icy cold winter, when sun-ripened vegetables and fruit rarely grace our tables. Hi Folks! I completed last month's challenge last week, but have just not had the time to write the post up. As its getting late, just thought I'd drop a note that the challenge was wonderful - I'll add the details and photos in the next couple of days. Thanks Sunita for a great summer challenge!! The early arrival of summer this year has been good for vegetables and fruits. After our annual ritual of strawberry picking in early June, we decided to join our local organic berry patch to pick summer raspberries!! Sadly some rather unseasonal rain led to the picking being canceled. The patch owner however had an excellent harvest. 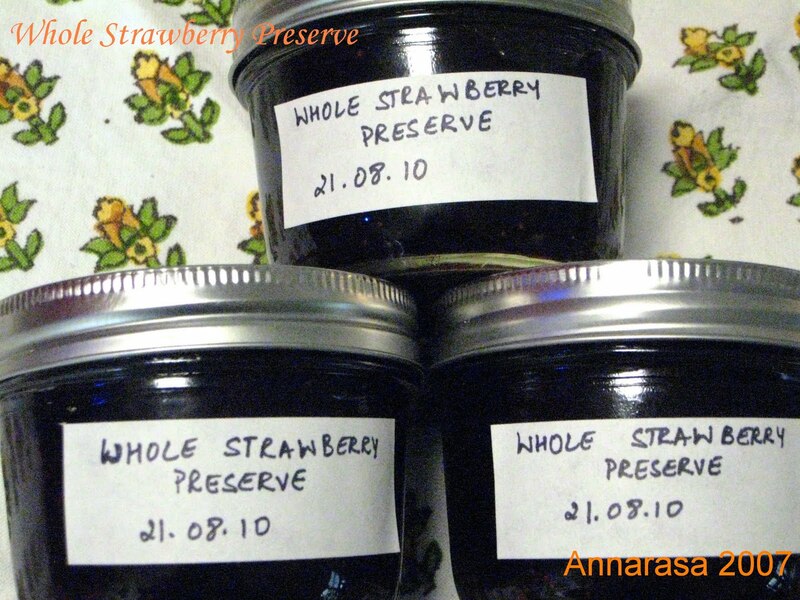 She contacted us and asked if we would like some pre-picked berries from the farm. We were delighted and got a pail of sweet-tart raspberries. Curries made with buttermilk and yogurt are an integral part of the Indian kitchen. 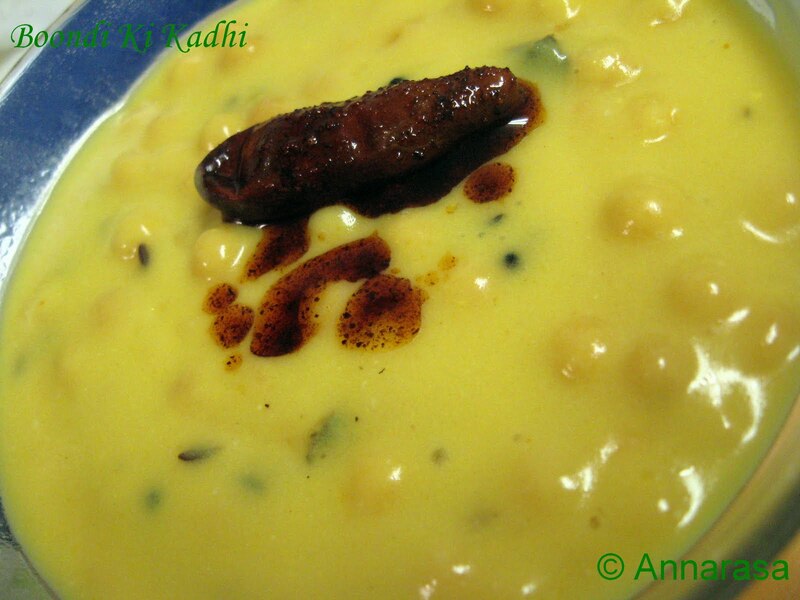 In most parts of the north, a creamy yet very light and delicious curry called Kadhi can be found. 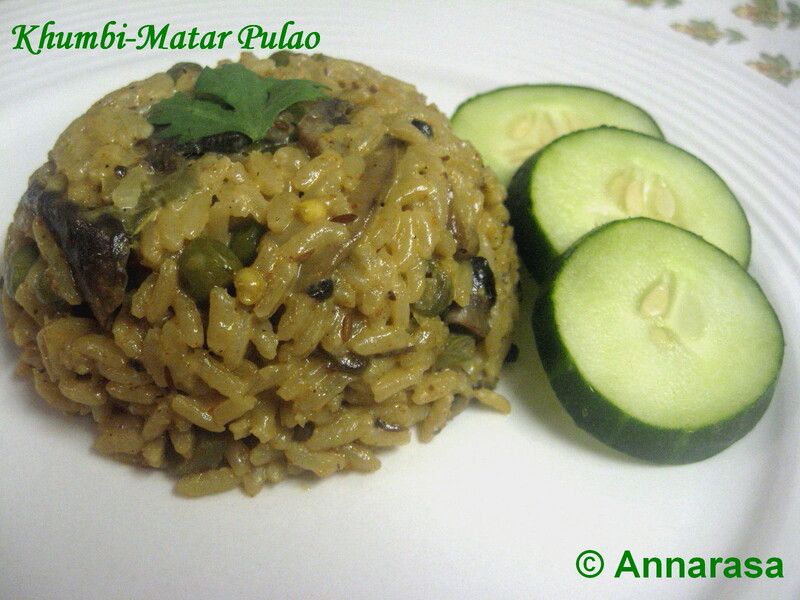 There are multiple variations of this dish which tastes equally wonderful with rotis, parathas, and rice!! While a spicy Pakode Wali Kadhi is probably the most well known in Delhi and Punjab, in Rajasthan a Boondi Ki Kadhi is served. The spices and flavours very considerably, but Kadhi is one of the easiest and quickest of food you can rustle up in your kitchen. Heat oil in a heavy bottomed saucepan. When it reaches smoking point, reduce the heat and add one by one the cinnamon, peppercorns, cloves, and red chilies. Roast for a few seconds. Then add the mustard seeds, cumin, methi seeds, and asafoetida. 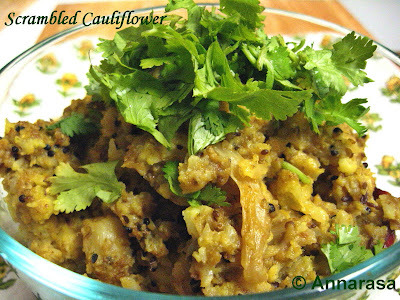 Follow immediately with the curry leaves and grated ginger. Stir well until you get the smell of ginger. Next add half a cup of water and simmer the ginger and spices for 4-5 minutes. Turn off the heat. In a a separate bowl, beat together the chickpea flour, turmeric, and buttermilk. The mixture should be lump free. Pour this mixture into the spice mix. and cook on a low heat for 5 minutes, stirring constantly. Increase the heat to medium, continue cooking and stirring until the mix begins to thicken into a sauce. Add the salt to taste, cook for another 5 minutes on a lower heat taking care the sauce does not stick to the pan. Add the boondi and let it sink into the curry. Turn off the heat. Cover. Prepare the tarka (seasoning) by heating the ghee in a small pan. Add the red chili powder. Pour over the Kadhi. Serve hot with parathas or rice. I love to serve this Kadhi with Spinach Parathas. The combination is simply amazing. This lip-smacker goes out to Priya @ Mharo Rajasthan who is hosting Think Spice, Think Fenugreek this month. 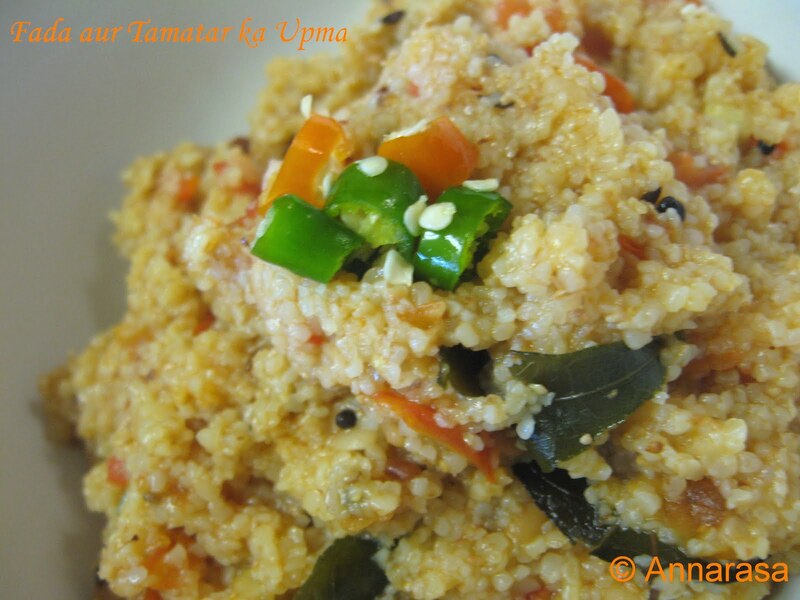 Think Spice is a blogger foodie event created by Sunita @ Sunita's World. 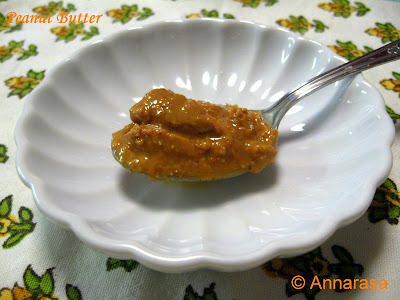 The Daring Cooks challenge for July is Nut Butters!! We could choose from any type of nut including peanuts, walnuts, cashews, pecans, almonds, hazelnuts, or macadamias. The instructions were simple - puree the nuts into a paste or butter. Then use the fresh homemade nut butter in a savoury recipe. I always try to buy local and fresh foods for my kitchen. Apart from our world class Farmer's Market, we have loads of other options for seasonal produce around here. We are surrounded by U-Pick operations that sell vegetables and fruits year round or deliver the goodies right to your home. In the summer, I prefer to go out and pick fresh vegetables and fruits. My last trip to the local farm got me a delicious harvest of carrots, beets, and new potatoes!! We took a break over the weekend. Lovely scenic lakeside town with a gorgeous pier, sunshine, ducklings, and the cool cool breeze. It was great to get away for a couple of days. But not so great for my plants! When we got back, they looked one sorry sight. The July heat had got to them!! After some serious watering and encouraging words, they are back to normal and I even see some tiny green tomatoes on my tomato plants!! The beans are doing wonderfully and I have already got one small harvest of yellow wax beans. Nothing like growing your own. Its been a hectic few weeks out here. Writing load has been heavy though enjoyable and I've had little time for cooking. In the last two weeks, summer appears to have arrived in full force, though we are seeing a great number of summer storms too. The sunshine and rain has worked wonders for the plants which are blooming!! I will get some photos of my garden up in the next few posts. French Beans were always a great seasonal favourite in Delhi. Fresh and tender beans would flood the markets in early winter. Sweet and crisp and known as Fras Beans they'd dominate the menu in a multitude of ways. Here I get beans all year round, the fresh ones too, as they come from all across the globe. I also grow them in my vegetable garden in the summer, and the yield is pretty good. Pate and bread!! Perfect combination that always reminds me of Michaelmas in London. Brightly lit streets, exotic foods in creatively decorated containers, and loads of colour and warmth all around. Pate is in-season and and so are herbed crackers that go with it. Then again pates remind me of summer in England - they make a wonderful addition to any picnic basket - whether you plan to watch the boat races or head off to the Wimbledon Greens for a day out!! Chole is a favourite dish in our home. While I make chole more suitable for chaat and tikkis, he makes them in a typically North Indian style. Tari Wale Chole is typical of UP and Delhi where you will find this curry being sold early mornings at railway stations and small eateries near bus stops. It is also popular in the many temple towns there. The curry of this chole is very simple to make yet is very flavourful. Ideal for dunking freshly made pooris!! Sometimes, when there is extra time on the hand, or we are expecting visitors, I like to make a snack for our evening tea!! Usually, it is something light and salty. At times, its a matter of using the leftovers!!!! Today, it was the latter - I had idli batter left over from the weekend. I decided to make spicy mini-appams using my aebleskiver or appe pan. 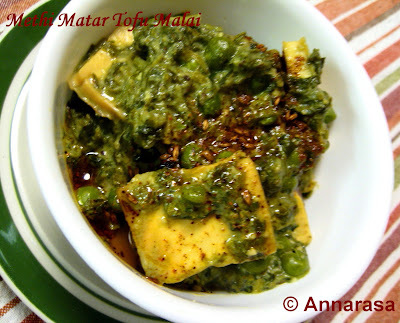 This is s typical dal-saag recipe that you will find in North Indian kitchens. It is considered to be a very light and healthy dish and commonly cooked on hot summer afternoons. Dal-Saag is served with fresh hot phulkas (puffed rotis) which are rolled very thin, plain yogurt and cool refreshing summer salads. Such a meal is very light on the stomach and great for any appetite ruined by hot Delhi summers - think 40C (100F+)! 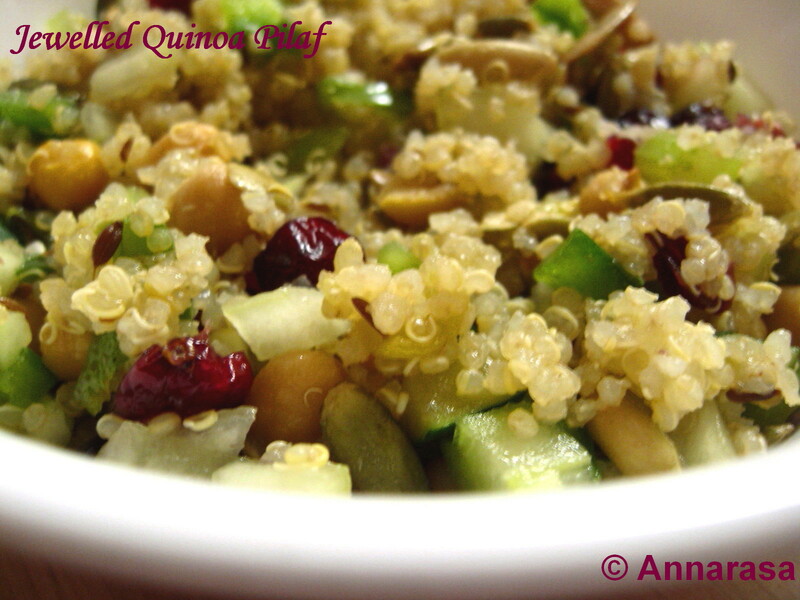 Last month I was the guest host to a food blogging event series called Healing Foods. This series has been created by Siri @ Siri's Corner. I chose Pomegranate as it is a much loved fruit, has great healing properties, tastes great, and can be used in a multitude of ways. This is a roundup of the entries I received for the month-long event. The entries are arranged as I received them! The other day I noticed that fresh local grown cabbage has arrived at our green grocers. I immediately picked up 2 pieces with tender leaves. The fresh cabbage grown locally - the one that has not seen the inside of a storage coolers has a great sweet taste and it is remarkably crisp. 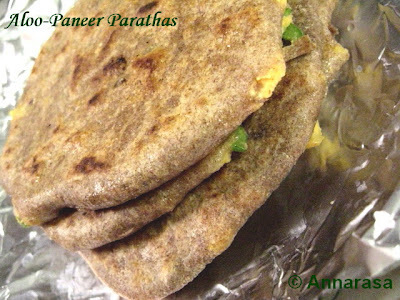 It is ideal for making soft parathas, as once grated it literally melts into the flour. The very word pudding for me evokes memories of winter in England. Steamed pudding with freshly made custard were a staple dessert for cold winter evenings!! I have not made steamed puddings since I moved here, and so when Esther of The Lilac Kitchen proposed puddings for a Daring Bakers Challenge, I was truly delighted. In fact, so excited that for a while I could not decide what type of pudding I wanted to make. I was torn between a ginger syrup pudding, a jam pudding, and my favourite a marmalade pudding - and I have delicious home made marmalade!! I have been making a lot of soups lately!! They make a great evening meal with a slice of good bread, a salad, or a even small serving of pasta!! Last night I had made a hearty Tuscan style Ribollita, and it seemed a no-brainer to make a rich crusty focaccia to go with it. Spaghetti is an all time favourite with so many families. While regular spaghetti has been around our stores as far back as we care to remember and is well loved; supermarkets are increasing stocking their pasta aisles with whole grain spaghetti, spaghetti with flax meal (read Omega 3), and multi-grain spaghetti. If you have been reluctant to try any of these out, don't be shy!! You are missing out on some great whole grain nutrition and significantly good taste!! Wholegrain pasta has a very wholesome and nutty taste, that enhances the entire flavour of the heartier pasta dishes, and takes on the thicker sauces very well. Toor Dal is a much loved staple in many Indian homes. It is usually served with steaming hot rice, a vegetable, and some spicy pickle on the side. I made this dal last week and seasoned it with slices of fresh green jalapeno fried gently in ghee (clarified butter)! 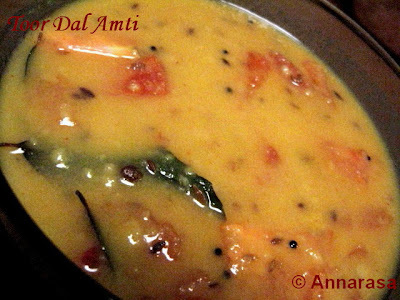 For a different but equally delicious seasoning with this dal, drop by at my entry in 2007 for JFI Toor Dal. The Daring Cooks challenge for April was a tough one for a vegetarian. Though our host Wolf was kind enough to discuss a vegetarian possibility for the classic Brunswick Stew, anyone can see this is a meat lovers recipe!! I considered making a version by simply dropping out the meats, but then it would really be no different from some sort of a mixed vegetable soup. Somehow that idea was not gelling with me but I did want to make a stew for this challenge. 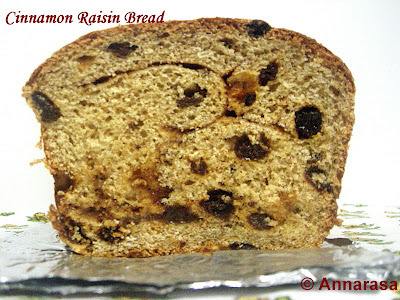 This post has a recipe from the Daring Cooks: March 2010. Though I did complete this challenge on time, I was travelling last month. Away from my home and computer, I was not able to put up the post. On return, I decided I'd post the challenges for March & April together this month. But just as luck would have it, my internet connection gave way last week and has been restored only this morning!!!! However, the Daring Kitchen Challenges are always so very tempting that I simply could not resist sharing my version of this recipe even at this late date. This is my version of an all-time favourite. Traditional recipes of Leek and Pea Soup or Leek and Potato Soup are plentiful. I personally like the taste of broccoli in mine. This soup has a delightfully creamy taste balanced beautifully with a squeeze of lime and freshly minced cilantro. The whole of last week was so sunny and warm that on Sunday I practically ran to the garden centre for some seeds, prepared baby plants, and potting soil. And then wouldn't you know it - since Monday we have had rain, thunderstorms, and hold your breath, SNOW!!!! Not entirely surprising as I am of the firm belief that it always snow at least once in April - the last kick of winter and all that. At last, a citrus dessert!! The 2010 March Daring Baker's Challenge was hosted by Jennifer of Chocolate Shavings. She chose Orange Tian as a challenge for this month, a dessert based on a recipe from Alain Ducasse's Cooking School in Paris. This is a deliciously creamy soup is a medley of cauliflower, carrots, and celery. Perfect for a chilly and rather rainy spring evening here in the North. Serve with a seasoned garlic and parsley bread for a nice and hearty meal. Fresh local cabbage will soon be in the market. Our Farmer's Market carries an amazing array of vegetables and cabbage is amongst the best I have tasted. It has the perfect crispness, just the right crunch on the bite and a delicately sweet taste. I wait every year for farm fresh cabbage to make this simple cabbage stir-fry. The trick to this recipe is to cook the vegetable uncovered on a medium heat. The most amazing and fresh winter vegetables line the outdoor vegetable markets in Delhi. Beautiful cauliflower, okra, green peppers, spinach, radish, pumpkin, beets, red carrot, and of course, juicy red tomatoes!! The cheap and surplus of tomatoes in the market were always a motivation to make chutneys, preserves, and jams! Yes, I remember tomato jam from my schooldays, when my benchmate introduced me to home made tomato jam filled between slices of spongy white bread. But I digress. A staple of Mexican food, refried beans are by any standard a delicious indulgence. We love Mexican food here and I am always interested in creating healthful vegetarian alternatives to world foods that we try in restaurants every now and then. This recipe of refried beans has the authentic Mexican taste that goes so well with tortillas, tacos, rice, and dips. I used this recipe to make the refried beans for the Festive Seven Layer Dip. Super Bowl Sunday had always been celebrated with a ritualistic fervour by my friends from across the pond when I lived in England. Somehow I never quite understood the enthusiasm. Most probably because I had not been exposed to the game, did not know the teams, or anything else about this annual event for that matter. I guess it was also because the time difference meant that the game one had to be awake past mid-night to enjoy the festivities - something my schedules would never permit. Kiwis are probably one of the prettiest fruits in the market. When I was growing up they were rarely seen in the fruit stalls of Delhi and Mumbai. My first memory of them is on chilled fruit tarts, sublimely green and rather exotic, sitting very prettily next to strawberries, and pineapples! When they first made an appearance in the local fruit markets, they were assigned a special place - imported and expensive. Interestingly they were also regularly confused with Chikoo or Sapota due to their dull brown-green skin!! 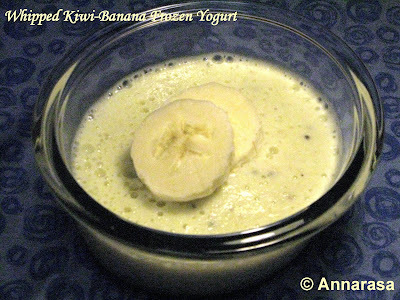 The two fruits could not taste more different, though each is lovely in is own way:) I love the sweet-tartness of the Kiwi and when paired with banana, its simply divine. Basbousa is the sweetest of sweet delicacies from Egypt and Lebanon. Soft, sticky, fragrant, and delightful is how I like to describe Basbousa. Basically, a Basbousa is a sweet semolina cake soaked in syrup redolent with lime and rose syrup! It is popular in eastern Mediterranean cuisines, and also widely available in various Middle-East countries where it is known as Hareesa. Though Turkish Delight, Halvah, Baklava, date pastry, and pistachios cookies are available in some stores or bakeries, you would have to find a speciality store for Basbousa. Food from the Middle-East is delicious, nutritious, and above all full of variety for both a vegetarian and a vegan diet. It is a cuisine that I have enjoyed and shared for many years now. In London, I would head out every so often to one of the many Maroush restaurants, Ranoush, Beruit Express, or the local falafel sandwich shop for my weekly fix of falafel, olives, pickled vegetables, vine leaves, salads, hummus, and fresh baked pita! Now I regularly prepare a variety of middle-east style foods at home. So when Michele proposed a Mezze meal for February, I was delighted. Michele kindly provided us (the Daring Cooks!) with 5 lovely recipes!! I chose to make the pita, falafel, hummus from her selection. And I added olives and seasoned cheese, a walnut-yogurt dip, and as it was Valentine's Day a dessert that I adore - Basbousa (An Egyptian Syrup Cake)!! We are seeing a lot of avocados in the market this winter. Avocados are a beautiful pear shaped green fruit, a berry really, with a soft buttery flesh. They are seen most popularly in guacamole, but you can eat avocados in sandwiches, sushi, use it pureed to thicken curries, in milkshakes, ice creams, and desserts. In a salad, they are divine! Pick a ripe but firm avocado for this salad. For the dressing I used a classic lime dressing with olive oil and honey. The roasted cumin adds great flavour and depth to its taste. Nanaimo Bars are a classic Canadian dessert created in Nanaimo, British Colombia. Pronounced as Nah-nye-Moh, these very rich yet addictively delicious bars have 3 layers: a base containing graham crackers, cocoa, coconut and nuts, a middle custard layer, and a topping of chocolate. We like our breakfast around here - especially so on the weekends when its more relaxed and I can be more experimentative!! Newspaper in one hand, tea cup in another, sunshine streaming in the kitchen window. Newspaper you ask - yes, well we must be the last of a rare and quickly disappearing breed of newspaper subscribers - though I must admit we get only the weekend papers. But then - what's a weekend without the paper!! After many many months I am back to baking regularly - breads, cookies, cakes, bakes, you name it!! Somehow I think winter and baking go really well together. The other day I had planned on Pav-Bhaji for dinner. Though I generally make my own pav bread - the store bought rolls just don't cut it - I wanted a to try a more nutritious version of the same. After a bit or research and some creativity, here is what I came up with!! Pretzels, the snacking variety, have never been a big hit with me. 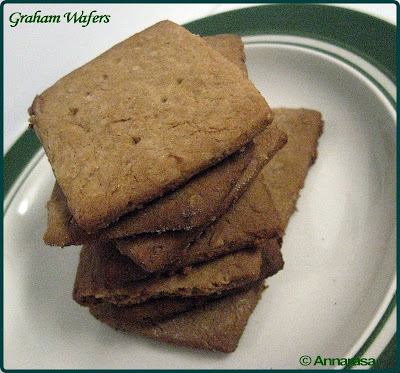 Whenever I tried them, I always felt that they were too salty, to malty, too hard!! Of course the liberal use of MSG in snack products has kept me always away from most of them for a while now. And this includes many processed foods in the organic, vegan, and gluten free aisles in various markets. Shocking, isn't it? Satay or sate is a popular street food dish consisting of sliced and marinated chicken/other meats/tofu, skewered on the midrib of a coconut leaf, and grilled or barbecued over a wood or charcoal fire. These tasty morsels are then served with a variety of spicy seasonings and dipping sauces. It is unclear where exactly Satay originated but it is very popular in most SE Asian nations including Indonesia, Malaysia, Singapore, Thailand, the Philippines and Vietnam. Did you know that Satay has multiple variations depending on the marinade uses, method of cooking and the dipping sauces provided!!!! 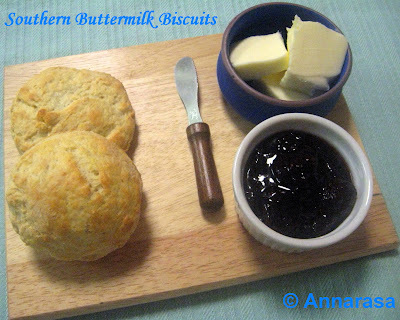 Cream Scones are the ultimate treat!! A quintessential part of the tradition of English Tea they are often served with clotted cream and a variety of fresh fruit jams and lemon curd. The best cream scones in England are found in the summer in the many tea houses that dot the pretty villages of the Shire counties!! The very very picturesque Cotswold's is famous for its cream teas and probably the best place to enjoy a pot of afternoon tea, freshly baked scones, and home-made strawberry jam. The holidays this year were fun, busy, exciting, busy.... need I say more :) We had family and friends over almost every weekend in the last 2 months and the Christmas break was no exception. We had a falafel lunch on the 25th - I made parsley hummus, fresh falafel, and home-made pitas. The day before I made a gorgeous three fruit marmalade, and baked a beautiful and crumbly olive oil cake. Freshly squeezed juices and blended smoothie heaven - mmmmm - what more can one ask for at the end of a long, full, and exhausting week.